A comprehensive 12 week prep program that includes all of your cardio workouts, strength training workouts, track/plyometric workouts and clean eating plan. 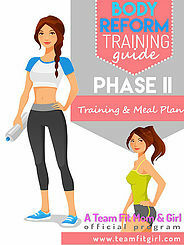 This prep plan is designed for those that have already successfully completed the first 12 week Phase I Prep Program and are ready for level 2. Consult your Team Fit Coach to decide what program is best for your goals.